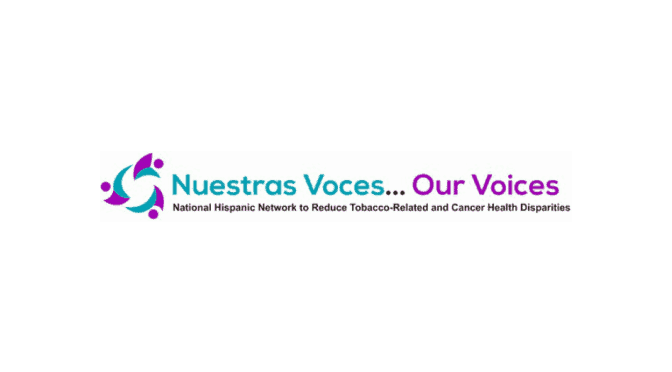 The Nuestras Voces (Our Voices) National Hispanic Network to Reduce Tobacco-Related and Cancer Health Disparities works with Hispanic communities and those who serve them to eliminate disparities in the areas of tobacco and cancer control. Areas of focus include decreasing exposure to second-hand tobacco smoke, increasing smoking cessation, increasing cancer prevention, and improving quality of life for those living with cancer. The Network collaborates with eleven regional sub-network lead agencies to facilitate training and technical assistance in their National Center for Chronic Disease Prevention and Health Promotion (NCCDPHP) regions for community-based organizations, health care providers, businesses, and other stakeholders. The regional lead agencies serve as regional Network representatives and help to directly respond to needs within their multi-state service area. Opportunities to provide input and participate in a national effort to reduce tobacco and cancer-related disparities among Hispanics. This program is sponsored by the National Alliance for Hispanic Health. For more info and resources please visit: http://tobacco21.org/.